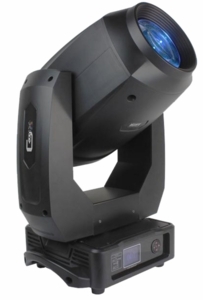 Powered by a 200W OSRAM® white LED engine with an extra punchy beam, the G-Mix™ 200 is a feature packed spot moving head that combines an exceptionally sharp white beam together with the rich color transitions of CMY color mixing. With 20,000 hours of operation life expectancy, no relamping will be needed for the entire life of the fixture, making it an LD’s immortal fixture dream! Smooth color transition and vibrant fixed colors can be applied from its unique system of three color wheels, plus rotating or static gobos can be added for projections and mid-air effects. Its smooth linear zoom can go from 42° at its widest, down to 5° to produce a piercing beam that can be trimmed with its ultra-fast stepless iris for really sharp output. The G-Mix™ 200 is topped with smooth 540/270° pan & tilt movement and dual gobo wheels for endless beam effects.